It’s finally time to scatter sunflower seeds around the dugout floor and enjoy a hot dog in the stands. That’s right, baseball season is back and Rowan is already off to a good start. 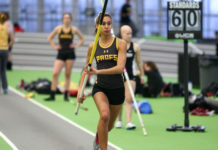 The Profs earned their first win of the season, a 7-4 result against Stevens Institute of Technology this past Sunday. Catcher Steven Hewa, right fielder Kyle Golla and second baseman Alex Kokos each collected two hits apiece, contributing for five RBI’s. Senior pitcher Rob Grilli picked up the win. The team will be looking to add wins early in the year, something they struggled to do a season ago. However, there was good reason behind that. Rowan was ranked in the top five for strength of schedule for 2016. On their trip to Florida for the RussMatt Central Florida Invitational, the Profs went 4-6 and were outscored by 16 runs. They also played Randolph-Macon College, a school that finished top-10 in the ABCA Division III Poll. This year, the brown and gold were picked third in the New Jersey Athletic Conference Preseason Coaches Poll and are seen as the dark horse in the conference. The key to performing better than that ranking is to improve on one of their main struggles from last year: winning close games. Rowan is entering their third year under Dickson, who has great history in the ‘Boro. 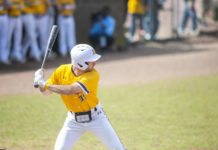 While dominating the diamond for the Profs from 1997-2000, Dickson was a three-time NJAC All-Conference selection and ECAC Metro Player of the Year. He also still holds school records for runs in a season with 57, and runs per game in a season with 1.58. Dickson spent time being an assistant coach for the Profs before becoming the man in charge at Rowan College at Gloucester County (RCGC). In nine years with the team, he accumulated a 360-88 record. In 2013, RCGC went 49-3 on their way to a national title and Dickson received the Skip Bertman National Coach of the Year Award. In his first two seasons as head coach in Glassboro, the Profs failed to reach the NJAC Championship game, a feat that the team accomplished in 2013 and 2014. Regardless, Dickson believes his experience will make his third time a charm. The Profs’ roster features a great mix of youth and experience, as 23 of the 37 spots on the team are filled by underclassmen. The trio of senior shortstop Matt Jolly, sophomore third baseman Dillon Mendel and sophomore pitcher Eric Shugars return after their NJAC All-Conference first team, second team and honorable mention accomplishments last year, respectively. With that talent and more returning in addition to the new players, the Profs have high hopes. The Profs head to Ashland, Virginia, this weekend to take on Randolph-Macon College in doubleheader action.